Good luck buddy! Remember not to hurt yourself. Listen to your body, not how much time you think you need to be pulling. Feel Free to message me about anything, I'm open. It could also be that your scleras are showing more simply because your body posture has gotten better, but your maxilla hasn't. With poor head forwards posture, the head is often rotated slightly upwards in order to compensate the recessed maxilla. 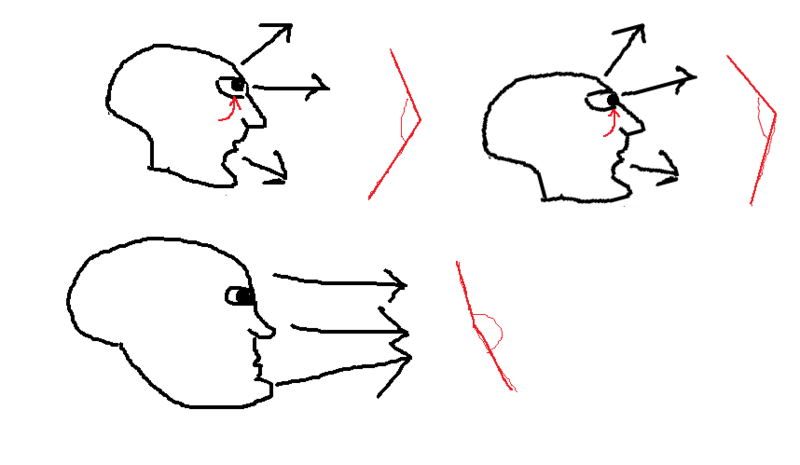 But when the whole head is held in an angle in order to artificially move maxilla to a more optimal position, it inevitably results in the upper half of your face being tilted upwards, causing your irises to stay closer to the bottom eye lid when looking towards the horizon. This helps the bottom eyelids to hide the scleras, although not in a good way biologically. People with good maxillary positions can set their heads directly towards the horizon line (with chin tucked in) and have no scleras show, because their bone structure gives enough support for the eyelids. Even though in reality their forehead and eyes are angled more downwards than those of someone who is compensating for maxilla. Good faces are almost convex-like whereas recessive faces are concaves (or the other way around, however it goes). @nobody. Thank you for your reply and diagram. I get what you're saying...Over the past year, I think my back posture has become a bit straighter because I've been 'barefoot' exercising and wearing shoes, less. This has resulted in strengthened ankles and straighter/more spaced out toes. (I believe Dr. Mew is currently doing research on the form /function of the feet, and body/oral posture, so that will be interesting...) Now, if I stand up straight and look straight ahead in the mirror, the sclera does show a tiny bit. However, my side cheekbones came out a bit since I've been mewing. However, I have a tongue-between-teeth thing happening on the right side of my dental arch, so I doubt my maxilla can properly go up/forwards, until that's sorted. Can't for the life of me expand it with my tongue though. I just wanted to say that I appreciate the effort you are putting into finding out the best way to facepull and putting up informational links like the one for face pulling with a belt! I am with you on that journey. and btw any updates ? especially from jamo716 ? mayb some side b side comparison ?